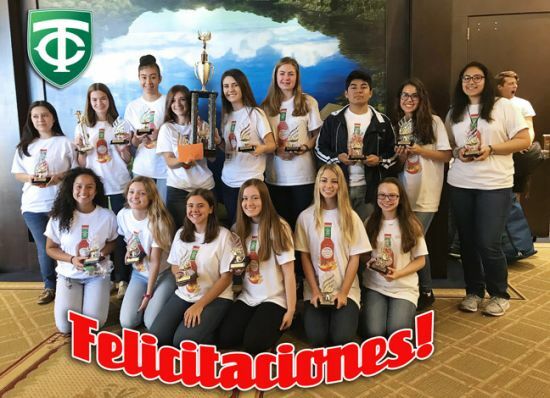 During the last few weekends Tampa Catholic students traveled to Orlando, FL to compete at the Florida State level French and Spanish Competitions. Congratulations to both delegate groups, their teachers and the volunteer chaperones. Both groups came away with tremendous stories and success. 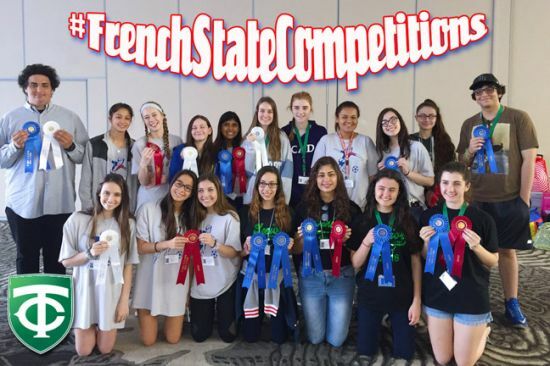 FRENCH COMPETITION: Eighteen TC French students participated in the French State Competitions from March 8th to March 10th, against 41 other schools from all over the state. Several of our students performed in two competitions and received awards for both!! Our team received a total of 12 trophies! FIRST PLACE trophies for Outstanding performances: Kayla Gil (2 first place trophies!!!) along with Laura Escher, Ricardo Rojas, Kimberly Hansen, Carolyn Blanco, Jancarlos Diaz, Giana Nardelli, Emily Gonzalez, Jimena Olaya, Patty Evans & Maria Berasain. Congratulations to all for winning their events. Fantastic performance also came from the following students who received second and third place award ribbons! SECOND PLACE: Kim Hansen, Alexandria Souto, Callie Alexander, Jimena Olaya, Emily Gonzalez, Carolyn Blanco. THIRD PLACE: Jancarlos Diaz, Mia Mudano, Patricia Evans, Maria Berasain. Additional member os the team came home with HONORABLE Mentions, including Julia Tamashiro, Shelby Tamashiro, Sachary Rovelo, and Camryn Castellano. SPANISH COMPETITION: Congratulations to our TC students for finishing 1st in their 5A Division at the Spanish State Competition. They recorded the highest score of any TC team since 2013 - scoring 968 points out of a possible maximum of 1000 points. The team ranked number five out of 48 total schools participating in the event. This is an outstanding achievement for our Crusaders and our World Language Department. Special recognition to Roxanna Masso-Maldonado for her amazing participation at the Spanish State Competition. 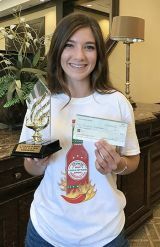 She participated on four events and received perfect scores in all four events; resulting in her winning scholarship money from the organizing state association. Super Roxanna! !